The new Lennar community features 85 townhomes and a limited number of single-family homes in Royersford, PA.
Lennar Corporation is pleased to announce that Southall by Lennar, a new community of 85 townhomes and a limited number of single-family homes, is opening on April 28 in Montgomery County. “Lennar is excited to unveil this new community with elegant finishes, open floor plans, gourmet-inspired kitchens and luxurious master suites,” said Anthony Mignone, President of Lennar’s Tri-State Division. 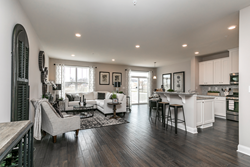 Lennar Corporation (NYSE: LEN and LEN.B) will host the Grand Opening of Southall by Lennar, a new community of 85 townhomes and a limited number of single-family homes in Royersford, PA, on Saturday, April 28 from 11am to 3pm. Those interested are invited to stop by to tour this highly anticipated new home community. Southall features modern layouts with three bedrooms, two-and-a-half baths, lofts, basements and thoughtfully designed living space. The community will also unveil the world’s first Wi-Fi Certified home design, where the home is engineered to offer Wi-Fi in every room with no dead spots. The Montgomery County community highlights scenic rural views and is just steps away from a robust local park and playground. It is also part of the highly rated Spring-Ford Area School District. The community is conveniently located near Coventry Mall and King of Prussia Mall, as well as other shopping, dining, entertainment and recreational destinations such as Valley Forge, Fort Washington State Park, Elmwood Park Zoo, the Act II Playhouse and the Conshohocken Brewing Company. Townhomes will be priced from the $300s, and single-family homes will be priced from the upper $400s. Southall by Lennar is located at 100 Ziegler Road in Royersford, PA 19468. Those interested are invited to join the community’s VIP interest list to receive news and updates by emailing tristate(at)lennar.com or calling 609-349-8258. Lennar Corporation, founded in 1954, is one of the nation's largest builders of quality homes for all generations. The Company builds first time, move-up and active adult communities under the Lennar brand name. Universal American Mortgage Company and North American Title provide mortgage financing, title insurance and closing services for both buyers of the Company's homes and others. Lennar's Multifamily segment is a nationwide developer of high-quality multifamily rental properties. Previous press releases and further information about the Company may be obtained at the "Investor Relations" section of the Company's website, http://www.lennar.com.